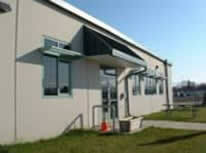 In March 2011, the Washington State Department of Corrections closed McNeil Island as a Corrections Center. This decision brought change and opportunity to CI. 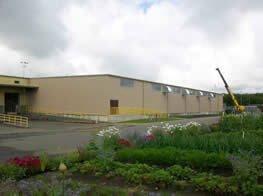 The move to Stafford Creek allowed CI to design a new factory from the ground up. Employing lean manufacturing philosophies and a state of the art design, the new factory fully integrates all furniture manufacturing including metal products, chairs, panel systems and furniture products into one plant. Modern computer controlled equipment, environmentally friendly finishing systems and an expanded product engineering department allows CI to be efficient, flexible and customer focused. In addition to the new furniture factory, existing vocational education programs are integrated into the design providing opportunities for incarcerated persons to learn, study and apply skills that translate into successful reentry and safer communities. 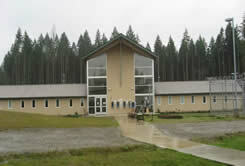 The new housing unit at Mission Creek is located on leased property from the Washington State Department of Natural Resources. The building is oriented to maximize sunlight along with individually controlled direct and indirect lighting. The use of natural lighting through clerestories in interior spaces minimizes energy consumption. These sustainable attributes as well as others contribute to energy efficient, well–lit, and healthy spaces for incarcerated persons. Mission Creek depends on well water, and resources to minimize water usage such as drought tollerant plants and water efficient fixtures were used in the expansion. The DOC project staff, design consultants, and general contractor took every opportunity to use LEED™ compliant materials. 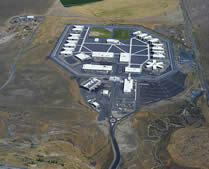 The $230 million dollar Coyote Ridge Corrections Center (CRCC) expansion is a new and innovative, state–of–the–art, 2,048 bed prison constructed for the State of Washington. Located in Connell, Washington, the project consisted of 578,400 square feet of inmate–housing and support space designed to minimize operating costs while maintaining security and maximizing the opportunity for rehabilitation of the incarcerated population. Although the CRCC project includes 21 individual buildings, the project submitted a single LEED™ certification for the entire campus. The US Green Building Council has awarded 39 points which means that CRCC has the first LEED™ Gold Certification for a prison campus. Innovative LEED™ features of the 39,000 square foot warehouse include a high mass building envelope, natural ventilation and no mechanical systems for cooling in the general storage areas, skylights for natural daylighting, a reflective white roof to reduce heat gain, exterior window light shelves that bounce light into the office spaces, and a ground–source heat pump which uses a series of geothermal coils to cool or heat the office spaces and provide hot water. This 10,000 square foot building provides space for training, general education classrooms, a computer training lab, defensive tactics area, and offices. Green building elements include rainwater capture for flushing toilets, waterless urinals, low flow lavatories, construction waste recycling, recycled content and local building materials. To our knowledge, the Jimmie Evans Training Center was the first correctional building in the nation to achieve the LEED™ Gold rating. This building – our first LEED™ certified building to actually house incarcerated persons – was made with recycled content concrete, steel, and other locally produced materials. Rainwater is collected and used to flush toilets. Cell windows were redesigned from the original plan to allow for more daylight. Ultra–high efficiency air filters are used in the ventilation systems. Non– or low–toxic paints and finishes were used where possible. A high–reflective roofing membrane was used for the entire roof area. Built on the site of a dilapidated barn, an old wall of ecology blocks was preserved and used as a retaining wall for the new building. Rock and concrete from the old barn was crushed and used for the parking lot and road base, and old bollards and all shop cabinetry were reused. Natural lighting was enhanced by adding a row of windows in the roll–up doors and skylights in the high bays. Propane is used for heating, as opposed to electric heat, and the same tank was also fitted as a refueling station for the numerous propane vehicles at the complex. (Previously, all vehicles were filled by an outside vendor truck or taken down the street for refueling.) Fifty percent of the baseline electrical load has been supplemented by "green tags" for two years to comply with the "green power" requirement for LEED™. Green features of the new Correctional Industries showroom and warehouse building, located in Tumwater, Washington, include managing all stormwater on site, water efficient landscaping, and reflective materials to reduce roof and non-roof heat island effects. Low-emitting adhesives, paints, carpets, and fiber board were used in construction, as well as recycled content products, and certified wood. The building is using green power and alternative fuel vehicles. There are views for 90 percent of spaces. Seven buildings in this expansion achieved LEED® Silver certification: an administration building, a core services building, an intensive management/segregation unit and four close custody housing units. This represents our biggest LEED® project to date. The buildings were made with recycled content, regional and low emitting materials. A variety of water saving fixtures were used, along with energy saving conditioning systems. Ninety five percent of all construction waste was recycled through the Correctional Industries recycling program. Capital Planning & Development (formerly known as Capital Programs) is committed to designing, building, and certifying to Leadership in Energy and Environmental Design (LEED™) Silver because sustainability is part of the Department of Corrections’ (DOC) Strategic Plan as a means to develop more effective and efficient business practices, and in support of the priority of government to protect the environment. In 2004, Capital Planning & Development established a policy to design and construct all new occupied buildings over 5,000 square feet and all major building renovations to at least LEED™ Silver Standards. This policy was in response to the Department’s Sustainability Plan that included a goal of building green. In 2005, the Legislature passed a law requiring these same two provisions for all state–funded building projects. The Department now has 40 LEED buildings completed and many more underway. Click on the images below for more information about that specific project.